My parents met at the hospital they were both working at in the early 1980s. It was one of my mom's first days on the job and her boss had given her a huge keyring and sent her on an errand; overwhelmed, she found herself crying in the service elevator when my dad stepped on. He helped her out, they got to talking, and they decided to go out on a date. Mom was still living at home, and since her mother was very proper, my parents' first date took place there instead of out somewhere. My mom cooked a lasagna for dinner and sent my dad home with the leftovers. When he woke up the next morning, his two roommates were both standing in the fridge with the door open, the container of lasagna in hand, and they told him that if he didn't marry this girl, one of them would. My dad proposed to my mom a couple years later, and she either said no flat out or initially said yes and then broke it off, I don't quite remember. Either way, the proposal ended with my father throwing the ring into the ocean with an emotional and dramatic flair. They were crazy about each other, but she was still young (21-22 to his 26-27) and not quite ready. A few months after, my dad was driving to work when he noticed a car crashed into a tree. He stopped to help the woman as best he could before the police and ambulances showed up. A day or two later, there was an article about the incident in the local newspaper that mentioned my father as also being hurt in the accident. My grandmother told my mother about it and said she should check in and see how he was doing. There was a reconciliation - and another lasagna - and they got back together shortly thereafter. In our house, we have lasagna once a year: January 1. It's a day of new beginnings, of letting go of the past and starting something new with hope and faith in the year to come. My mom makes a gigantic pan of it, full of several kinds of meats and cheeses and tons of her homemade tomato sauce. We eat it for dinner on New Years but due to its size, we continue to enjoy it for days afterwards. It's far from low calorie, but it's a once-a-year thing and something I'd qualify as emotionally healthy. I'm okay with enjoying a piece once a year for the sake of tradition. I like to think about my parents as young kids, going out on dates - it's so easy to think of them as "just parents," but once upon a time, they were my age, and totally crazy about each other. I think about the things I do when I'm smitten with a boy, and I picture my mom and dad in the same situations. I wonder if my mom got a crazy smile on her face just thinking about the cute boy she had plans with that night. I wonder what some of their dates were. I wonder what thoughts were racing through their minds the first time they kissed. I'm in all sorts of unknown territory with Matt. This is all so completely new to me - he keeps asking me to hang out! He really likes me and wants to spend time with me! Unreal. A year ago, I barely wanted to spend time with myself. This is all kind of like weight loss, to be honest - I started with the knowledge of 345 and the dreams of 135, but never really gave much thought to the experience and feeling of 295 or 230 or 199 or any other in-between stage. We had our first date, and it was great. Then our second - my first second - and it was awesome. But I never gave much thought to what dating would be like beyond the second date because date #2 seemed like a lofty enough goal. There was a first second, but then there was also a first third, a first fourth, etc. I've seen him seven times now, and it kind of amazes me. We've gone out to eat on about half our dates, and even though I've made good choices, I still prefer to cook for myself and be in control of the food preparation process. Going out to eat is socially healthy once in a while, but with all the sodium and hidden fat and whatnot, it just isn't something I like to do all that often. We've talked about cooking and eating well, and he's very receptive to it, which I'm pleased about (he's also agreed to my deal of I-cook-you-wash-dishes, a total plus). The trick now is to find something that works with both our tastes and our restrictions - I don't really like red meat, he keeps kosher, that sort of stuff. With tradition in mind, the other day I made a lasagna for our lunch date. In theory, it was like Mom's, but cross-section slices of the two would reveal their differences. For starters, mine fit in an 8"x8" pan, maybe a tenth the size of my mother's usual offering. I didn't use full-fat cheese where I could, and I used ground turkey instead of a mixture of ground beef, Italian sausage, and pepperoni. Matt's a bit of a picky eater with veggies, and I'm fresh off my month of being vegan, so I tried to reconcile both our needs by adding chopped spinach to my cheese layer - I remembered hearing about Jessica Seinfeld's cookbook "Deceptively Delicious", which gives lots of family-friendly recipes that have fruit and veggie purees hidden in them for extra nutrients, and figured I'd give it a try. 1. In a medium-sized skillet, sauté onion until semi-soft. Add garlic and ground turkey and cook until browned (but not fully cooked - it will be done when the lasagna bakes). Add 1 1/2 cups of tomato sauce and set aside. 2. In a medium-sized bowl, mix ricotta, cottage cheese, and 1 cup of the shredded mozzarella. Add egg, spinach, red pepper flakes, and basil and stir until well combined. Set aside. 3. 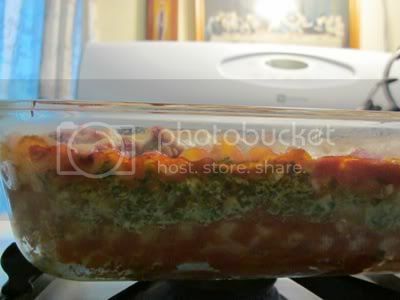 In a large saucepan, add lasagna noodles to boiling water and parboil for 5 minutes. They will NOT be done cooking, but again - this process will complete when the lasagna is assembled and baked. 4. Spoon a layer of sauce to coat the bottom of an 8"x8" baking dish (about 1/4 cup), then top with a layer of noodles (I found that my noodles were longer than my pan, so I trimmed them down and used the ends to fill in gaps). Add the meat/onion/garlic/sauce mixture, spreading evenly over the noodles. Add another layer of noodles. Add the cheese/spinach/herbs/spices mixture, spreading evenly over the noodles. Add a final layer of noodles. Top with remaining sauce (about 1/4 cup) and sprinkle with remaining 1/2 cup of shredded mozzarella cheese. 5. Bake at 350º F for 35-40 minutes. Allow to cool 10-15 minutes before serving to let it set up. I cooked mine a day in advance and served it reheated the next day - the flavors are always better when they get a chance to sit for a while. This made six good sized servings at 435 calories each with the ingredients I used, not bad for how filling it was. It was traditional enough to feel connected to one of my favorite love stories while different enough to be "ours," in a way. He loved it, veggies and all. And I loved that he loved it. So I'll call it a success, even if it wasn't the best lasagna I've ever eaten. Next time, I'm going to use Italian turkey sausage instead of just plain ground turkey - I added herbs and spices, but something was still missing, and I think it was whatever Italian seasonings go into the sausage; we need that flavor while still being pork-free. What about you? What's your go-to "man-bait" meal? Have you ever snuck fruits/veggies into recipes - and if so, which ones? My go-to meal (man-bait or not) is coconut shrimp with an apricot-horseradish sauce. I've converted 4 coconut/coconut shrimp haters into lovers of this dish. It's the first meal I ever cooked for B and is still one of his favorites. But it's time consuming, so we only do that one for big get togethers. If it's just us, then I do my spaghetti with garlic cheese biscuits. Really easy and very tasty. I don't really try to sneak extra stuff in - I do make B drink V8 Fusion with me and we try and add salads or at least one veggie to each meal. I love this story, and that lasagna looks DELICIOUS!!! Yum!!! I'm going to make this sometime this week! I'm actually going to the store today. I'll do it with turkey italian sausage. I've made spaghetti sauce with ground turkey and no matter how much seasoning I put into it I noticed that it was "missing" something too. What a wonderful post!! I love hearing how you have started your own tradition!! A healthy one at that! Way to go! That is a GREAT story about your parents! How fun to have a tradition like that. Cutest story ever - I love your family tradition too, and I also love that you have found your way to fit this into one of your first dates with Matt. Yay for dating!!! Thank you for sharing the story! Lasagna is definitely the go-to meal in our house. I use vegetarian meat in place of ground beef, but "never" tell the guests. They all love it! Yours looks delicious! I love the melding of the two stories. I cooked something I call Iranian Dish for my husband on our first date at my home. It is a saffron rice, spinach, cinnamony lamb, onion all topped with thick yogurt casserole. Not very man baity, but it turns out that is now my husband's fave dish. I sent him home with it. The first thing my husband cooked me was fish on the grill (that we caught)and an acorn squash that he cooked in the oven whole. Seeds and all. Sorta scared me. He only had a watermelon and a bottle of champagne in the fridge. Scary to think we went on to have a restaurant! Italian food is honest to goodness man bait for sure. I sneak veggies in all the time, but that is because I have a fussy toddler! I make muesli bars that have courgette, carrot and pumpkin in them and she loves them. 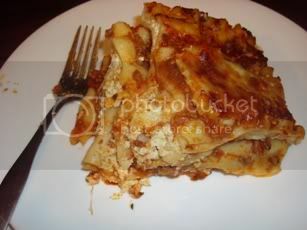 Great post about your parents and I am pleased that Matt like the lasagna.